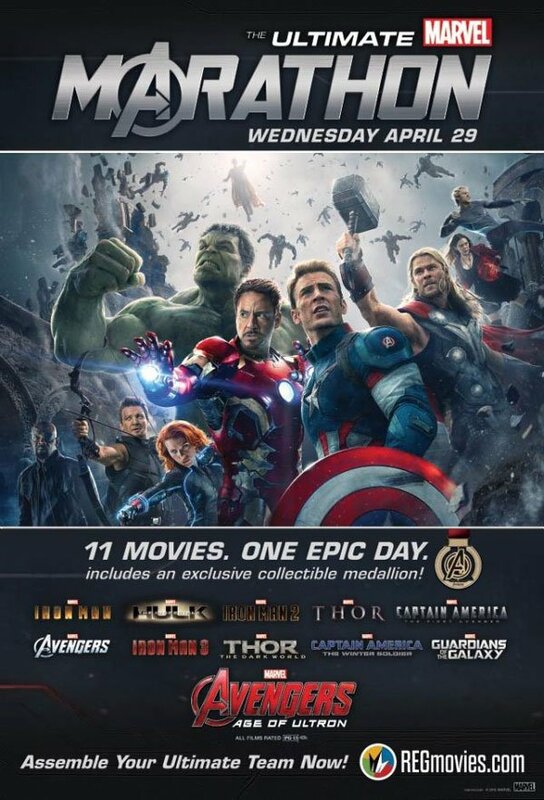 With the new Marvel Studios film launching its final theatrical trailer earlier today, and pre-order tickets going on sale, both AMC Theaters and Regal Entertainment have announced that they will each be hosting "Ultimate Marvel Marathons" on April 29th that will conclude with a two-days-early look at The Avengers Age of Ultron. The two companies are running their events a little differently, so lets take a look at them separately, shall we? A 29-hour movie marathon is a pretty intense experience, but this also does sound like a lot of fun. That being said, I'm not sure being completely exhausted from watching 26 hours of movies is the mood that I want to be in when I see Joss Whedon's The Avengers: Age of Ultron for the first time. I suppose the best way around this would be to nap during some of the not-as-great movies in the Marvel Studios canon - but that also feels like a cop out. For those who decide to see The Avengers: Age of Ultron in a more conventional way, the film will be getting a wide release here in the United States on May 1st. It's without question one of our most anticipated movies of the year, so be sure to stay tuned for more updates in the coming weeks. Just under two months left, people!